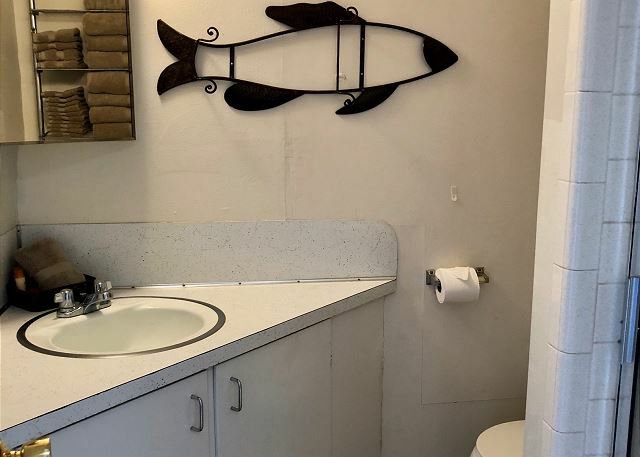 Vacation rental house. 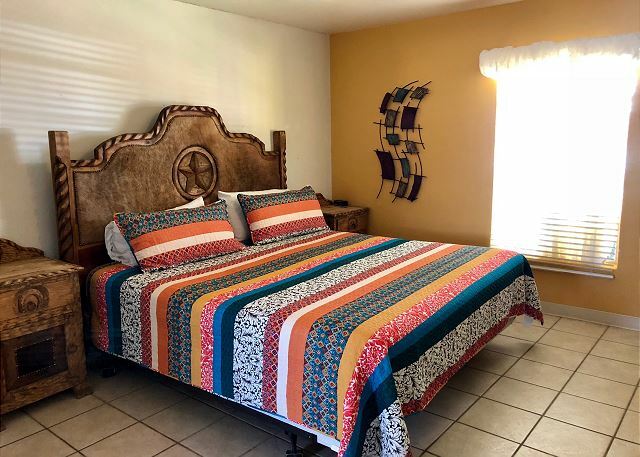 Sleeps 20, 5 bedrooms, 5 bathrooms. No pets allowed. The Lake House/Cottages sleep 20 people and are one story structures. 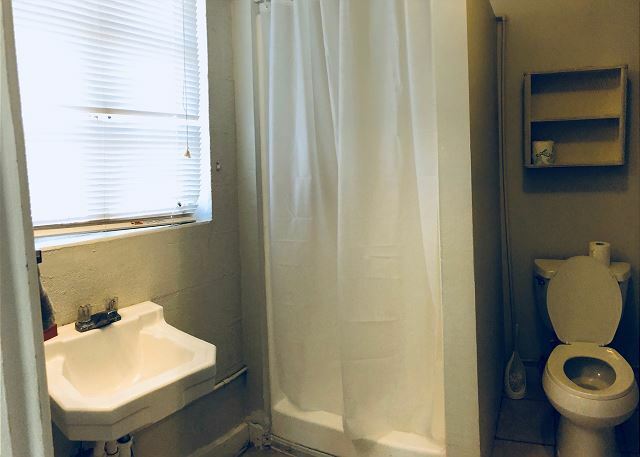 There is a main house and two cottages included in this rental. 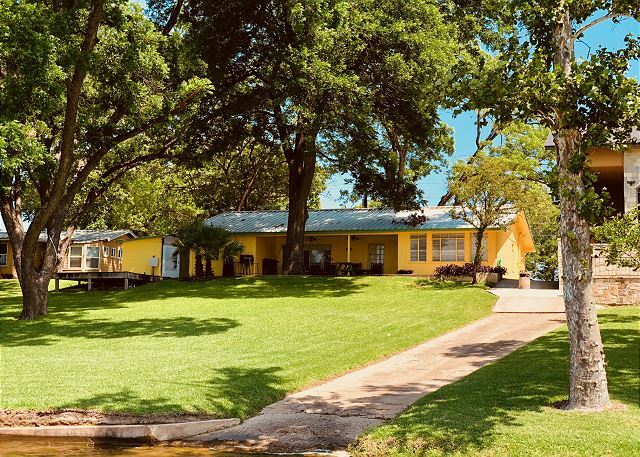 The property is located on beautiful Lake LBJ. The cottages are located next to the lake house and are designed as an efficiencies. 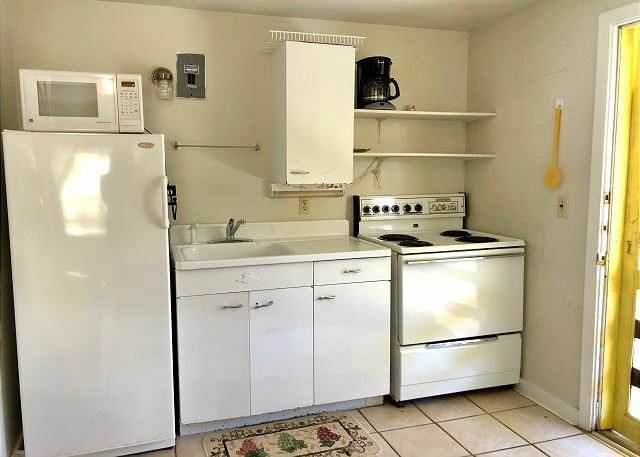 Each has its own kitchenette furnished with apartment size appliances. Cookware, dishes, flatware, etc is provided for 4 in each one. 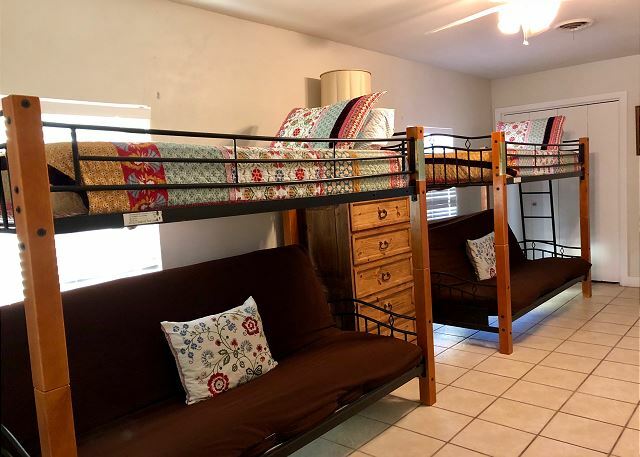 Open sleeping accommodations are available with a queen bed plus a bunk bed having a twin on top and full futon on the bottom. 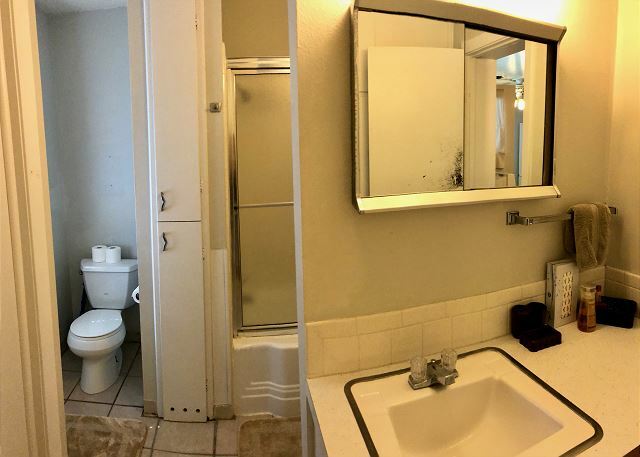 Both have a private bath with shower stall, but no tub. Guests will have a covered boat dock with lift, fishing pier, washer/dryer, fire pit, BBQ grill and smoker, central air and heat. 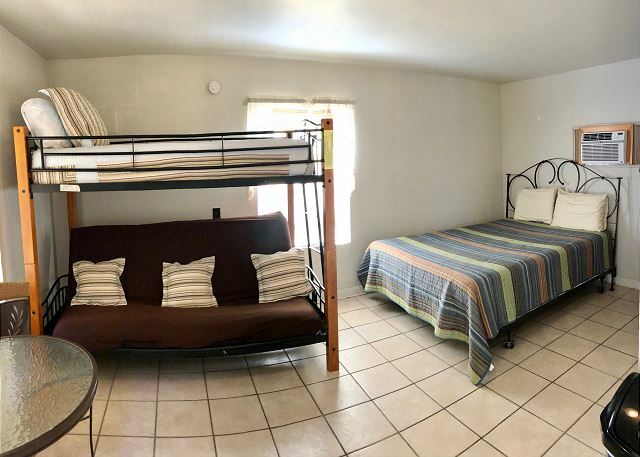 The main house has a bedroom with king bed. 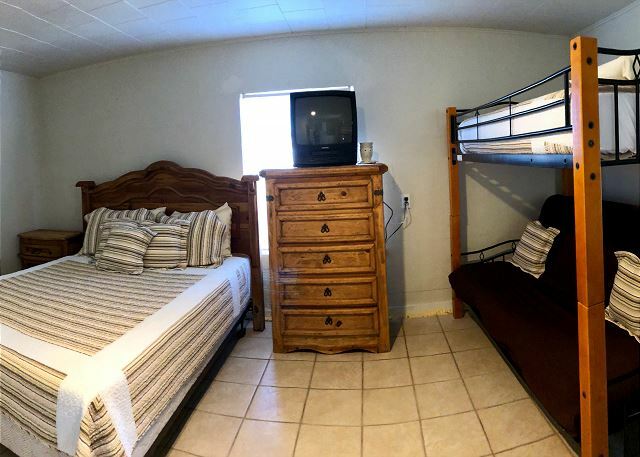 The second bedroom has 2 queen size beds and 1 bunk bed while the third bedroom has 2 bunk beds (doubles on bottom/twin on top). 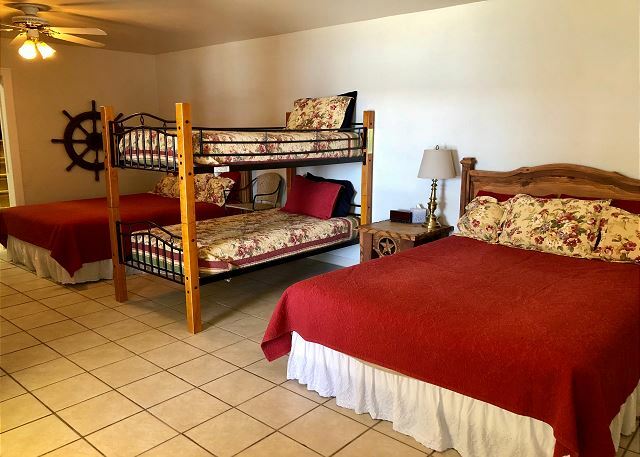 There is also a very small bonus room with a set of bunk beds. 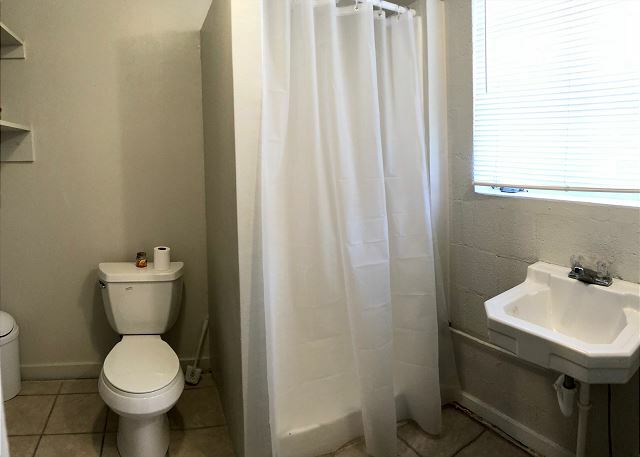 The Lake House is fully furnished with the conveniences of home. 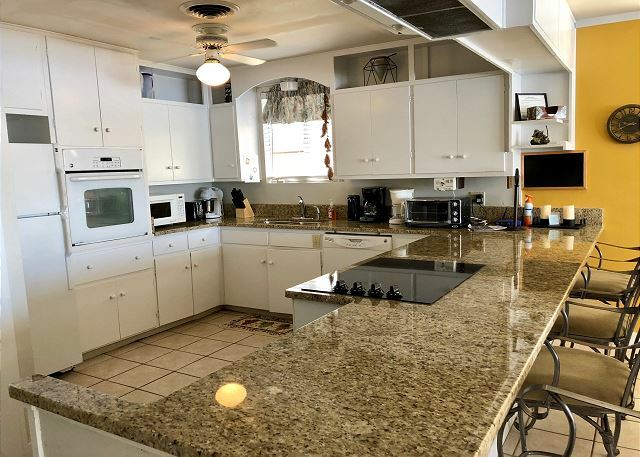 Although the kitchen is fully equipped you will want to bring any special cooking dishes or utensils as well as all consumables and condiments. The open concept floor plan of the great room includes the kitchen, dining and living areas. 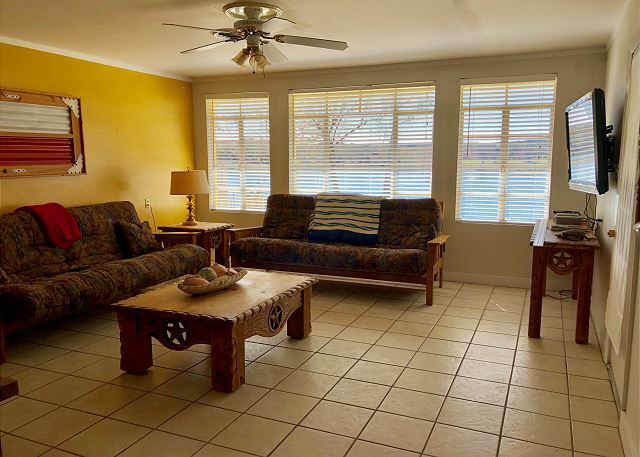 The view of Lake LBJ from the great room will have you itching to get on the water. 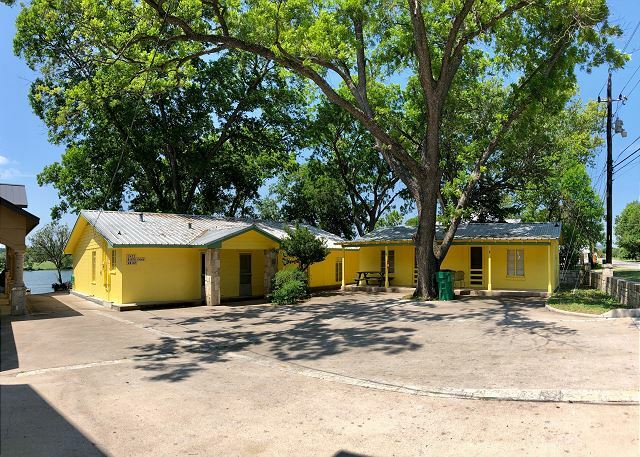 This is an older structure perfect for a large group planning to spend time outdoors and on the lake. 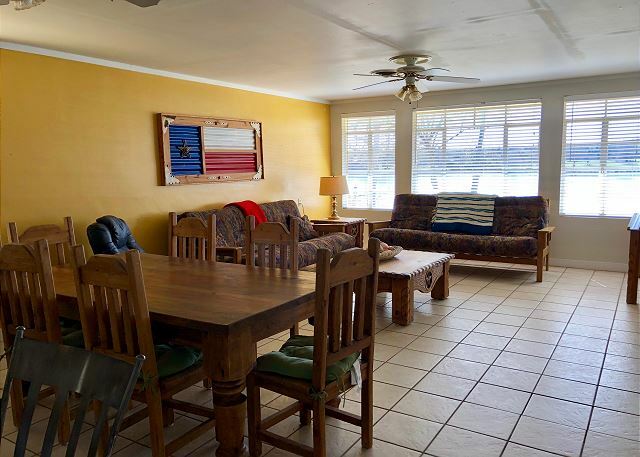 The location of this property on Lake LBJ is ideal for doing just that! 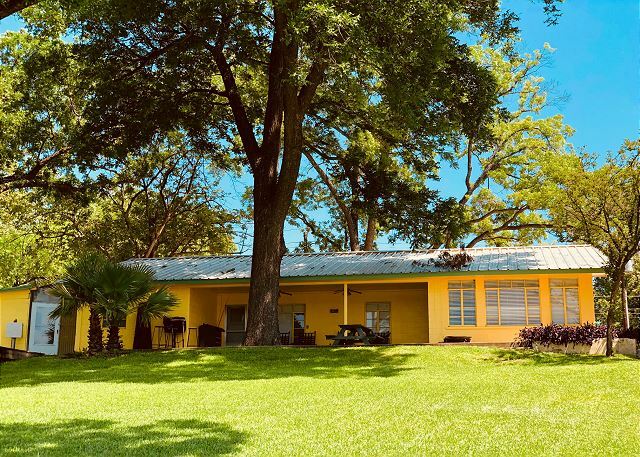 The beautiful shade trees with a breeze off the water will cool you off while you relax on the back patio area. The charcoal grill will be popular as family and friends gather to enjoy the fun of an outdoor barbecue. Early evenings are the perfect time to throw a line in the water and test your luck (and skill) at landing the catch of the day! As a guest at Green Harbor Lake House/Cottages you are invited to take the short drive over to Log Country Cove. The common area has all sorts of fun things to do. You will enjoy sand volleyball, complimentary putt-putt golf on the 9-hole course, swings and picnic areas. A rope swing will entice you to jump right into the roped off swimming area. During the summer months a water trampoline is placed in the lake for Log Country Cove guests and watercraft rentals are available through the Boat Room just outside the office. Fishing is permitted all along the retaining wall and from the pier. The Sunset Pier is perfect for relaxing and taking in the Hill Country sun setting over the waters of the Colorado Arm of Lake LBJ. Before returning to Green Harbor be sure to explore the Sarayu Trail that winds throughout the 170 acres of the resort. You may spot one of the 24 beautiful log homes situated in the midst of Mother Nature at her best. 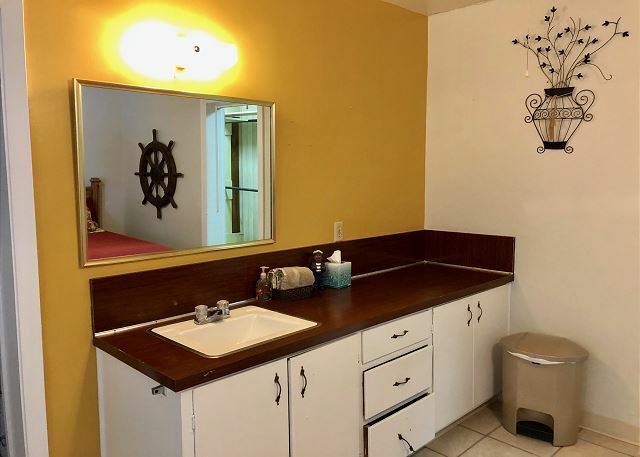 Green Harbor Lake House/Cottages offers a prime location on the lake and access to the amenities of Log Country Cove common area. Come and enjoy. You will be glad you did! Rooms Sleeps 20, The Lake House/Cottages sleeps 20 people. The property is located on Lake LBJ. 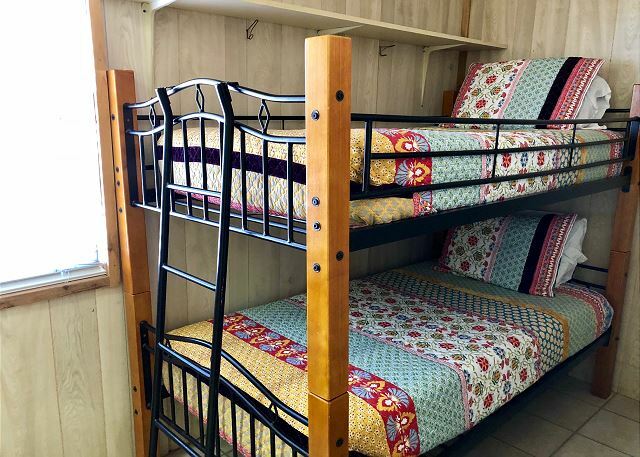 Cottages are located next to the Lake house and each cottage has its own kitchenette, a queen size bed in each as well as a bunk bed with a full futon on the bottom. Great place, clean, comfortable, spacious and friendly management staff. Enjoyed the stay.